You’ve probably seen videos of diesel truck and SUV owners having tug-of-wars to determine whose rig is the most muscly. There are multiple factors which can affect how these tug-of-wars play out, but a lot of it is down to traction. Traction is what we’re assuming helped the 6.6-liter Duramax-equipped Silverado in the video below win a tug-of-war with a semi-truck. 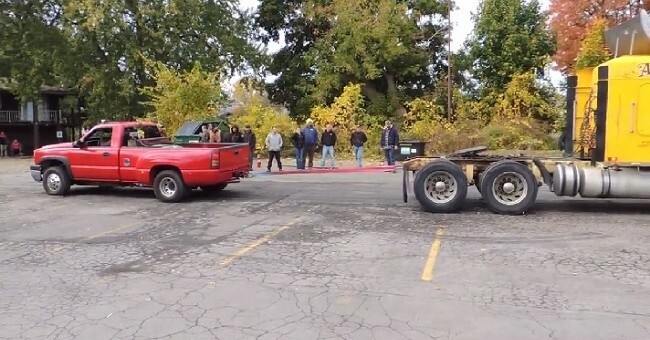 The first time we watched this video we expected the Chevy to get dragged around the parking lot with ease, but we were pleasantly surprised when we saw the semi getting out-powered by a measly three-quarter ton pickup. The Silverado appears to have a lot of weight in the bed and according to a bystander in the video, it’s also got “$15,000 worth of engine work.” As the semi fruitlessly spins its rear tires due to lack of traction, the Chevy slowly tugs the huge transport in its direction. Check it out in the video below, but if you’re at work you might want to wait until your home, there’s some choice language near the end. I have driven a tractor like that and I know without weight of a trailer it cant pull crap, put some weight on the 5th wheel and watch what happens. This is a farce. Very true, but that red HD is no joke! Best part: when the Tractor tried to walk off with him, and the red HD started pulling him back , and got a little slack in the line, and straight yanked him! Sure that semi didn’t have as much traction as that Chevy, and then 6.6 duramax doesn’t stand a chance to approximate 14 L six pot diesel. But it’s impressive how this “little pickup” moves a approximate 20K pound truck that is trying to move the other way!! !